MotoGP™ and WorldSBK are two championships with many similarities but profoundly different. Both focus on speed, but while one aims to test state-of-the-art technology on track, the other looks to push the limits of what is achievable on a production machine. Throughout the years, countless riders, technicians or engineers have jumped over from one paddock to the other. Giulio Nava has walked over this bridge in both directions: he began his career in WorldSSP and has then since collaborated with riders in both WorldSBK and MotoGP™. This year he joined forces with Álvaro Bautista, becoming his crew chief at the Aruba.it Racing – Ducati team after several years in the opposite paddock. The man who sat alongside Ben Spies throughout his conquest of the 2009 WorldSBK title, Nava is aiming to repeat this feat a decade later with another WorldSBK rookie. The first signs are promising, to say the least – six wins out of six for Bautista. What convinced you to accept this project, to join Bautista and Ducati? It was an easy choice to make, Álvaro and I have known each other for a long time, we worked together in Aprilia. It’s much easier to collaborate with people you already know, who you value and whose potential you understand. Those were the main reasons I said yes. Then there’s also the relationship with Álvaro which goes beyond the professional side – we are linked by a true friendship. On the other side, Ducati called me. 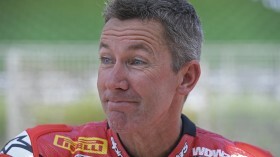 It was a very stimulating option because it’s a big company with strong roots in both MotoGP™ and WorldSBK. The project is very solid, and I already knew some of the people who I’d be working with; there were others I only knew by name, but all of them are professionals. So, it wasn’t too hard to find the reasons to accept. What changes as a crew chief between MotoGP™ and World Superbike? Basically, the job is the same. 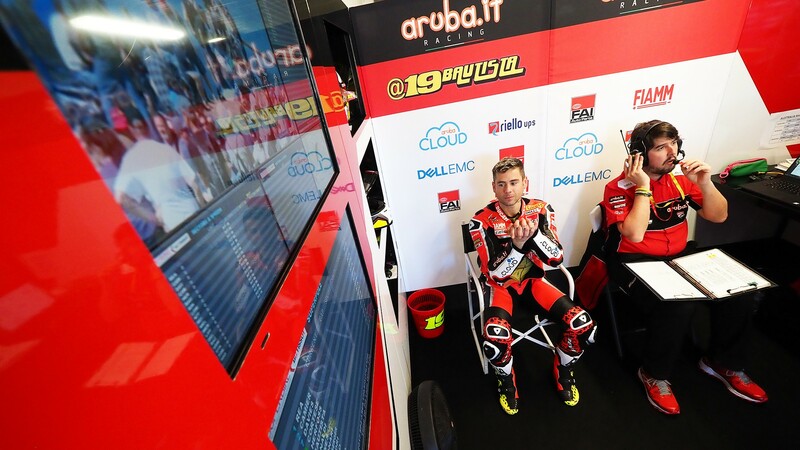 I have the obligation and the honour to administrate a side of the garage, I have to find solutions from the info that our computers, telemetry and rider recollects. The difference with MotoGP™ is the type of championship, the tracks, the tyre supplier and the fact that here there is just one bike. That is a destabilising factor at the beginning, because having two machines as you do in MotoGP™ basically simplifies your work during practice sessions and qualifying, when there’s little time and you can’t go back if a modification doesn’t work. In WorldSBK, with just one bike available, it’s tougher because finding the right configuration in the least amount of time is even more important. Ducati has invested a lot of resources and energy in the past few years to bring both titles back to the Borgo Panigale factory. As a key figure in the WorldSBK side of this challenge, how are you enjoying the experience? I think everyone is important, starting with the work that people do back in the factory. I use the tools that someone has left at my disposal. My job is to make the rider as fast as possible with what we have. If at the end of the race the rider complains about something, I have to inform them so that in the factory they know what to work on and where to find solutions. We can’t take all the merit because everyone is indispensable, everyone has a fundamental task on the way to getting results, we all need each other. It’s a team effort. Your career went from WorldSSP to MotoGP™ and back to WorldSBK. What’s it like to be back in the paddock after so many years? It’s fantastic to be back in World Superbike, it’s where I started my career and returning was easy. I’ve been lucky to reacquaint myself with many people I worked with before. They’ve welcomed me very well, it has been relatively easy to start working with them again. Where might Álvaro find more problems? And where may he have an advantage? The bike is very young, every pit-out is a new experience from which we get more data, we’re still developing it and we expect to improve. I think the difference will be made with the adjustments we can propose and if, for example, we can ask for some things and receive them ready to test for the next race. I don’t think the tracks themselves affect too much. When we visit tracks Álvaro already knows the problem will be relatively small; on the other hand, when we face tracks he’s never competed on we’ll have to take that into account, it will be more challenging. We’ll have to find the set-up and give him time to learn the circuit, the riding lines and his reference points. Right from the first race, we’ve been able to see just how high the level of competition is this year. What are your strong points? Competition is strong. Lately we’ve read stuff in the newspapers, such as the fact there are fewer riders, the grid is shorter, but the level and quality of the official teams and riders is higher than in the past. Other teams have an advantage over us because they’ve competed with the same bike for many years, they have a consolidated package which goes beyond the rider or the bike’s potential. In general, I’ve seen that the rivals are there, I haven’t noticed any big differences between one or another. The key will be to find the best compromise each time to try and cover our issues and strengthen our strong points. Don’t miss the third round of the season, at the Spanish circuit of MotorLand Aragon from April 5th to 7th, thanks to WorldSBK VideoPass.